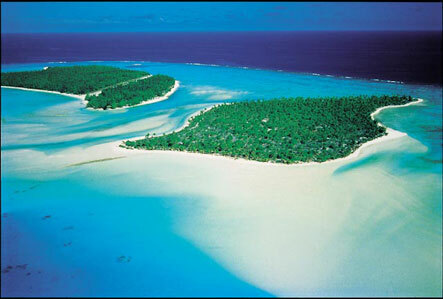 Just an hour's flight from the islands of Tahiti and Moorea, lays the fabulous and magical atoll of Rangiroa. You'll fall in love with the sparkling, translucent waters of the lagoon, the exceptional marine life, the dense tropical vegetation, the numerous excursions and the warm welcome by the inhabitants of the island. All passionate travellers and divers (experienced or not!) who are searching for an authentic paradise will find what they are looking for on Rangiroa. Rangiroa consists of 240 motu (islets) separated by more than 100 small canals that form its coral reef, a little less than 300 metres wide but over 200km long. Only two motu are inhabited with a total combined population of 3,000 people. A road of 12km runs along the beach, making it possible for you to visit the island. By bicycle, the road may seem a bit difficult, but in a fun car or buggy you will enjoy discovering the landscape without getting tired. 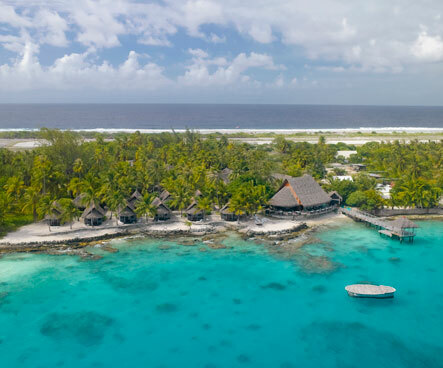 Rangiroa is a place of ultimate relaxation, while many excursions and activities are also available if you want to stay active and keep in shape, including: scuba diving, fishing trips, outdoor activities and much more. The staff at Hotel Maitai Rangiroa would be happy to help you plan any excursions on the island - just contact us or come and see us at reception. Rangiroa is truly a dream destination. Take a moment to visit our photo gallery to discover a small glimpse of the magnificence of the atoll. 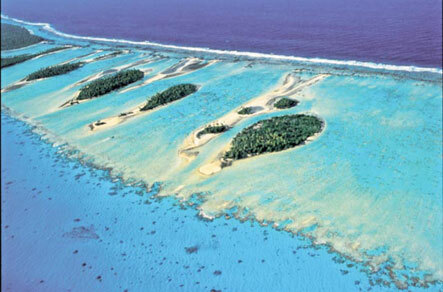 Historians believe that Rangiroa was uninhabited up until the 5th century. Several marae (temples) and dozens of gardening pits have been found in several villages. In the 17th century, Rangiroa established important relationships with other islands in the Tuamotu and Society archipelagoes. The vestiges of great marae and large villages near the passes attest to the vitality of the social, economic and religious life of the time. In 1770, the defeats suffered against the warriors of Anaa resulted in people deserting the island where the villages had been destroyed. Much of the population was slaughtered and the crops abandoned. In 1821, the population that had fled to Tahiti, Tikehau and Makatea was able to return to the island under the protection of the ruling Pomare clan. The first European Catholic missionaries settled here in 1851 and encouraged the population to plant coconut trees for copra. This ushered Rangiroa into the colonial era. Rangiroa benefited from the economic and urban growth of Tahiti in the 1950’s. Its farmers supplied large quantities of copra, and fishermen organised themselves to take advantage of the lagoon. They supplied the workers of the French Phosphate Company of Oceania (CFPO) and shipped 40 tons of fresh fish in 1960. The opening, in August 1965, of a 2,100-metre runway enabled the development of tourism. The village of Tiputa was chosen as the administrative center for the municipality of Rangiroa.